Archaeologists have discovered the oldest clay "fireplaces" made by humans at a dig in southern Greece. 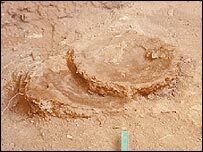 The hearths are between 34,000 and 23,000 years old and were almost certainly used for cooking by prehistoric inhabitants of the area. Are women getting more feminine?